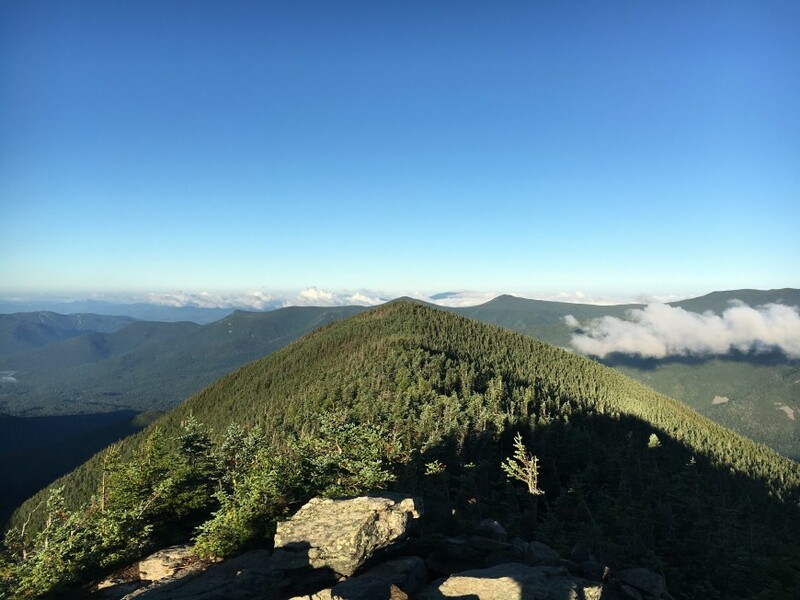 West Bond Mountain is situated in the eastern portion of the Pemigiwasset Wilderness, and features some of the most spectacular sunset views, sunrise views, and views of Bondcliff and the Pemi Wilderness. Located far from every trailhead, it truly is an absolute gem only for the serious White Mountain hikers. This trail begins by crossing a suspension bridge over the East Branch of the Pemigewasset River and continues on very flat ground for 1.2 miles until you reach the bridge crossing Franconia Brook. The trail goes along an old logging railroad, so it is flat, wide, and features old railroad ties. The Wilderness Trail continues after the bridge across Franconia Brook for another 1.8 miles before connecting with the Bondcliff trail. This is another mostly flat section along the old logging railroad. Between the Lincoln Woods Trail and Wilderness trail is a great way to make up time by running or moving fast. You will see many casual walkers out on these trails as they are wide, flat, and offer views of the East Branch. The trail gains the majority of the elevation up Bondcliff. There are not many viewpoints until nearing the summit. Once hikers summit Bondcliff, there is 1.2 miles of exposed trail leading to the summit of Mount Bond. Only a short distance from the summit of Bond, you will find the spur trail leading to West Bond. This trail is .5 miles long. Though it is out of the way, the views are worth it. There are a few campsites along the way which can make this long day hike easily split into two shorter days of hiking. Franconia Brook Campsite is located about 3 miles from the Visitor’s Center on the east side trail (Not the highlighted route above). This is an option for hikers to save 3 miles by camping out here, but there is no bridge to cross the East Branch, so in times of high water, the only safe way is to come all the way back to the suspension bridge (Which won’t save you mileage). AMC’s Guyot Campsite is located about .6 miles from the summit of Mount Bond. It is a caretaker managed campground with a fee of $10/person/per night. Features four single platforms, two double platforms, composting outhouse, dishwashing area, and metal food boxes for bear protection. Stealth Campsites: You legally have to camp 200 feet off the trail and outside of a .25 miles from Mount Guyot. With this being said, there are well established campsites just off the trail that would technically be against the rules and you would be susceptible to a fine of $125. Or you can take the legal approach and find an area at least 200 feet off trail. There are also stealth sites along the spur heading to the summit of West Bond. AMC’s Galehead Hut This is a full AMC hut located off of South Twin and Galehead mountain north of the bonds. AMC’s Zealand Falls Hut This is another full AMC hut located next to Zealand falls. Both Galehead and Zealand hut are pretty far from the bonds, but are options for individuals hiking the Pemi Loop, or hiking along the entire Twin Range. There are also some sites along the trail between Guyot and South Twin which you may be able to set up a tent or hang your hammock from a tree. Hikers can choose to hike to West Bond from the north, which can lead hikers over Mount Guyot. You can choose to begin this hike from several locations as if you were hiking Zealand Mountain, North and South Twin, Galehead Mountain, or Mount Garfield.